Hi, I am interested in your 1977 MG MGB (stock #5096-CHA) listed on Autotrader for $9,995. I'd like to get more information about this vehicle and confirm its availability. Iconic, fun, and affordable, this 1977 MG MGB is the nimble British droptop that instantly reminds you why you love driving from the moment it catches your eye (and in a color like this, it catches a lot of eyes!) The color on this is akin to the Flamenco Red that was only offered on these MGBs for a few years. Theres an instant boldness to it, especially with the glossy finish that pops in the sunlight. So you know its the right color to have on a sunshine-friendly convertible. Plus, theres more shine in the full-length side trim, optional luggage rack, and iconic Rostyle wheels. And while all this gives this car a bright personality, it also has the appeal of a well-coordinated contrasting dark side with the black bumpers and crisp black top. So this is a car of distinction even with the roof is in place. As good as this might look with the roof up, we all really know the secret to enjoyment is when the top is stowed. In fact, you can tell there has been a nice investment keeping to top is good condition, so its easy to fold back and open the MGB up to the world. The interior offers a deep and dark presentation to make sure this has a very well-coordinated color appeal inside and out. Detailed nicely with a taut boot cover and proper MG logo plate in the dash. Of course, what youll like most about the interior is the way it conforms to you. The high-back bucket seats, grippy steering wheel, crisp gauges w/large speedo & tach, and a gearstick in the right place for you to rest your hand this is built for motoring. Under the hood is a correct 1800cc motor. These were already known for their peppy performance, but this one does it better. It inhales deeper with an upgraded Weber carburetor, and it exhales freely as the heat-wrapped header feeds the exhaust. Youll even spot nice supporting components, including the twin electric fans. Its a stout motor, and you get to take full advantage of it with the four-speed manual transmission that also includes electronic overdrive. Because you have power brakes w/discs up front, the grip of modern tires, and MGs nimble handling, this one is ready for your favorite open road. Its time to strap a picnic basket on the back and enjoy driving again. 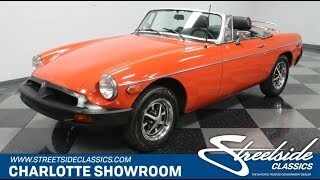 This bold MGB is waiting for you, but at a price like this, it wont wait long. Call now!